Like many people, I waited so long for D’Angelo’s new album that I stopped waiting. Its title, Black Messiah, partly mocks the idea that any artist—even the so-called R&B Jesus—could warrant such anticipation. But it’s also about something greater: the problem of waiting for messianic leadership from “on high” and the current refusal to wait for justice. A work of urgent and insurgent funk, Black Messiah is perfectly pitched to a moment when traditional appeals to power have given way to loving acts of solidarity and hard-dancing demands. So while his title clearly plays on Isaac Hayes’ Black Moses, his album cover features not the solitary artist but a group of people with open hands and raised fists. D’Angelo himself comes armed with a group he calls the Vanguard: Questlove, Q-Tip, Pino Palladino, James Gadson and Kendra Foster. The album starts with an ominous love song that recalls James Baldwin’s description of the violent love affair between black and white America. The creepy lyrics evoke a one-sided romance where “you can’t leave me, it ain’t that easy,” while the snare on the backbeat sounds like a lash. 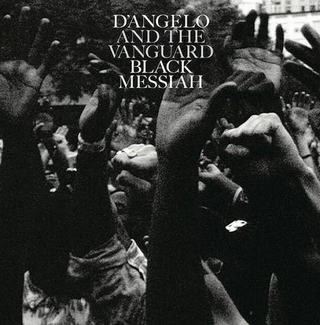 Here is the mixture of violence and desire at the heart of the black musical tradition, to which D’Angelo pays inventive homage on every track. “1000 Deaths” begins with a sermon by Khalid Abdul Muhammad that paints Jesus as a “black revolutionary Messiah” who hails “a new world order.” D’Angelo sounds as if he’s singing through a veil or a mask, like Sly Stone on “There’s a Riot Goin’ On.” Then he starts to scream. There is space to breathe and laugh here, too. “Sugah Daddy” blends complex school-yard rhythms with cheeky lyrics and sassy swing harmonies à la the Andrews Sisters. “The Door” simply ushers someone out of it with a whistle and a smile. These layers climax with special force and beauty in “Another Life,” which renews the chic, no-expense-spared, ’80s love song and moves the idea of going “back to the future” into a more seductive zone: “In another life, I bet you were my girl.” In the context of this album, the song reflects Audre Lorde’s vision of “sexual healing” as both personally and politically resonant. Fittingly for a song called “Another Life,” D’Angelo modifies and multiples his own voice, sounding at times like a diva, playing both seducer and seduced, setting the terms of this love affair and sounding as breathless and strong as a people who are no longer waiting. Emily J. Lordi’s book Donny Hathaway Live will be published by Bloomsbury in the fall of 2016. She is an assistant professor of English at the University of Massachusetts, Amherst, and the author of Black Resonance: Iconic Women Singers and African American Literature.